When my family and I first heard of couscous we were gobsmacked. Why? Because in our mother tongue of Persian or Farsi.. ‘cous’ is a bawdy title for the female genitalia. Yep, that escalated quickly. Anyways, as you can imagine, hearing the TV lady advertise a product called couscous (not one but two!) had my mother utterly astonished and giggling, hard. And to this day, she hasn’t gotten over it. Every single time couscous is mentioned we all fall into a laughing frenzy. ‘Moroccan couscous’? ‘Turkish-style couscous’? Ahahahah stahp! Anywho, despite it’s silly title, couscous is one of my favourite health foods as not only is it tasty but also incredibly easy to prepare (follow your packet instructions but it’s usually just a matter of combining couscous with hot water in a bowl, covering it for a few minutes then fluffing it up with a fork). 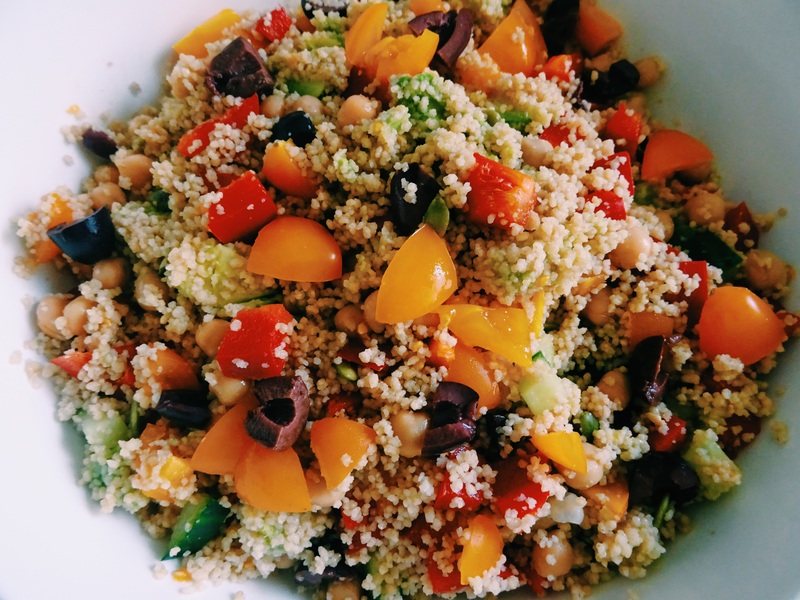 Creating a filling and nutritious meal with couscous is so simple; all you need to do is combine it with a variety of chopped vegetables, nuts and or seeds then mix it all up with some olive oil and vinegar and ta da you’ve now yourself a quick and healthy meal. In fact, I’ll be taking a few packets of organic wholemeal couscous with me to Japan for those times (and I guarantee there’ll be many) I need to whip up something good, fast.